For $199 per pax, you get a 3D2N Weekday Lost World of Tambun Exotic Room Stay with Breakfast, 2 Way Coach and Admission to Hot Spring and Lost World of Tambun Park withÂ Lunch and Boat Ride (worth $388). 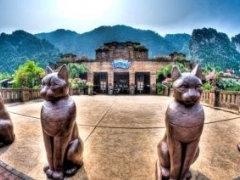 For $229 per pax, you get a 3D2N Weekend Lost World of Tambun Exotic Room Stay with Breakfast, 2 Way Coach and Admission to Hot Spring and Lost World of Tambun Park withÂ Lunch and Boat Ride (worth $428). Named after the Tambun Hot Springs and not for its nebulous location in relation to the capital city, Lost World Hotel provides an adventurous escapade into a sanctuary buried deep within lush surroundings and boiling water. Plonk up feet in the exotic room, which features Queen-sized bed or 2 single beds, Wi-Fi and basic room amenities. With today's Groupon, head to an array of attractions neighbouring the hotel, including the Lost World of Tambun theme park and the Lost World Hot Springs & Spa, a 100% natural mineral hot spring that refreshes and rejuvenates the body at the slightest hint of water. For something more relaxing, travellers head over to Lost World Hot Springs & Spa, a 100% natural mineral hot spring that refreshes and rejuvenates the body at the slightest hint of water. Open till night, the Lost World Hot Springs & Spa lets guests marvel at the natural and man-made beauty of the facilities under the cover of darkness. With today's Groupon, embark on a unique all-in-one experience that promises to soothe any wacky adventure plots while maintaining your safety. Reviews I enjoyed the hot spring spa and the visit to the theme park. I was also pleasantly surprised that Giant was within walking distance and I could get everything I needed at a reasonable price. Transport to the city was also available from the hotel at reasonable price." It's affordable and convenient for those who wants to enjoy the theme park. Especially the hot springs at night. Change of clothes in a clean bathroom is just a walk away."